A colour viewing box ensures that the viewer always sees the same colour, even at varying lighting conditions. Some examples of light sources are shop / office light (TL84), house light (A) and artificial daylight (D65) which has a UV content which is defined according to D65. It is possible to order a colour viewing box with an additional UV light. However, the user must bear in mind that this is only needed if a client wants to test artificial brightening agents in materials or make them visible. For a regular evaluation of colours by means of a colour viewing box, such a UV lamp is definitely not necessary. 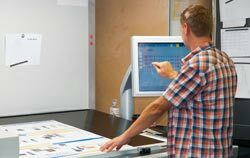 You can find out how individual colour viewing boxes are designed and what special features they offer by clicking on a product of the category colour viewing boxes below. Colour viewing boxes form part of production processes of manufacturers of many different goods. These devices are used in the quality assurance of existing products as well as in the development of new products. 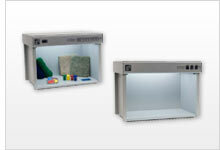 We offer a wide range of colour viewing boxes. They are available as daylight boxes which simulate how a product looks in daylight but we also have other colour viewing boxes which are designed to simulate a higher number of light sources, allowing a detailed simulation of products under different lighting conditions. The reason for these simulations is that producers would like to offer products which are always of the same colour. The technical term for the phenomenon when equal colours look differently under different lighting conditions is metamerism. With a colour viewing box, such metamerism can be prevented to make sure that only high-quality goods are produced. You can purchase a colour viewing box directly in our shop or ask our technical staff for advice regarding this type of product. The PCE-CIC 11 color lighting chamber is a simulation instrument, which is mainly used in quality control. The color lighting chamber accurately corrects light types and thus enables the direct comparison of products which must have special color characteristics. A color lighting chamber is used wherever products must have the same color properties during production. A color lighting chamber contributes to quality control. The color lighting chamber is a simulation instrument which is capable of displaying certain situations in order to analyze color characteristics of individual samples by means of different light types. A color viewing box enables the user to make direct color measurements of goods which are planned to be produced or which are being produced already. Therefore, color measurements by means of a color viewing box are crucial for companies that wish to offer products of high and constant quality. This color viewing box supports up to four different light sources, depending on the model. The GTI MM-1e color viewing box is needed wherever people try to manufacture products of equal colors with high precision. There are color viewing boxes with two to three light sources, depending on your requirements. You can buy this color viewing box here, in our online shop. The GTI MM-1eUV color viewing box is needed wherever people try to produce products of equal colors with high precision. There are color viewing boxes with two to three types of light, depending on your requirements. You can buy this color viewing box here, in our online shop. This GTI MM-4e color viewing box enables you to visually measure and compare colors with the help of five different light sources. This makes a very accurate simulation possible to make sure that the results can be analyzed as precisely as possible. This means that the lighting situation can be clearly depicted and metamerism can be detected. All of us have noticed that sometimes the objects have different look, in particular, different color, when we bring them home from the market and store, and very often it is quite frustrating to find out that something has happened with the color, and at the store the thing we liked so much, looked much better. Even more important it is to avoid such mistakes in color assessment in the industrial field, and to ensure that the color has the necessary saturation, or, for example, will not look shockingly different in a new lighting surrounding. Depending on what light is the source of illumination, the color may seem to change. In the manufacturing process, there is no place for subjective evaluation, that is why a reliable device is necessary the use of which may eliminate or at least reduce the problem of correct color detection. In the production of fabrics, wallpapers, packaging materials, clothes, cars, printed materials, such as magazines, brochures etc., products made of plastics and ceramics and so on, color is of essential importance. It plays a crucial role for designers, professional photographers, specialists working in the advertising, when a wrong tint, which the color receives under this or another lighting, spoils an impression, implies material losses and failure on the market.